Spicy Potato And Bread Rolls recipe by Maysa M Hussain at DesiRecipes.com. MAKE A MIXTURE OF THE BOILED POTATOES, CORRIANDER LEAVES, CHOPPED ONIONS, CHOPPED TOMATOES, GREEN CHILLIES, CHOPPED CAPSICUM, SALT , RED CHILLI POWDER & JEERA. 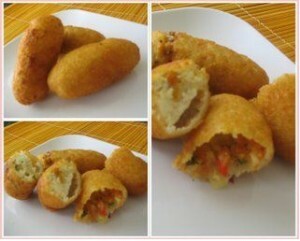 MAKE ROLLS OF THE MIXTURE & COVER WITH THE BREAD CRUMS, AFTER THAT DEEP FRY TILL GOLDEN BROWN SERVE HOT WITH KETCHUP! hii i just wanna do we have to roll the mixture in egg first so that the bread crumbs could easily stick to it?i dont think it will stick if no egg? Is your potatoes chopped or mashed??? Thanku for ur kind words. Any suggestions in this context will also be appreciated. i luv ur all recipies,they are practical can be made easily. salamwalekom, thankyou to provide how to make it,i am indian live in japan, i so happy to u introduce pototo and bread rolls. its verytasty i made it. shukriya, dhanyawad.